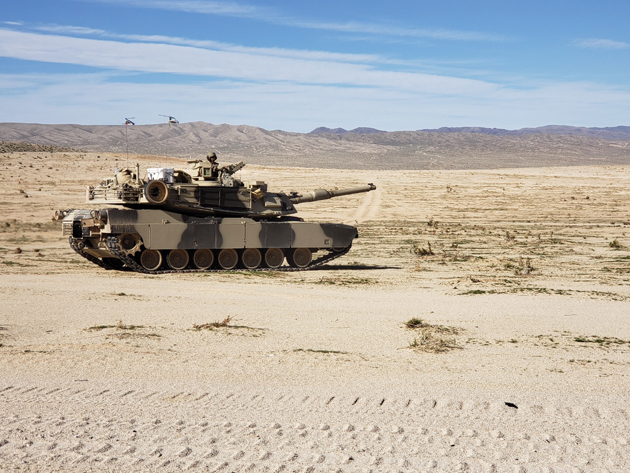 Hawg M1A1 Abrams Tank provides over watch during Rotation 19-05. 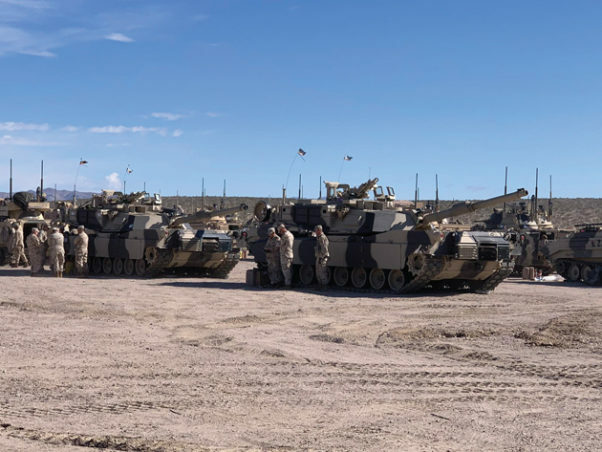 During Rotation 19-05 at the National Training Center (NTC) on Fort Irwin, Calif., Hawg Company (H Co), 2nd Squadron, 11th Armored Cavalry Regiment received and employed three M1A1 Abrams Tanks. Tank units from across the Regiment, provided H Co their Abrams in preparation for their upcoming Gunnery in June 2019. H Co used the tanks during force on force training against 2nd Brigade, 1st Infantry Division from Fort Riley, KS. Despite being 19K Armor crewmen, this presented new opportunities and new challenges to the Troopers of Hawg Company. Hawg Troopers ordinarily operate inside of Opposing Forces Surrogate Vehicles (OSV) and Main Battle Tanks (OSV-T), which are a visually modified M113 chassis. These modified battle tanks and vehicles provide a replica of adversary forces to rotational training units. The Troopers of Hawg Company welcomed the opportunity to operate their deployment platform to highlight its lethality in the NTC environment. H Co quickly associated its Soldiers with the M1A1 Abrams and the intricacies of preparing it for combat. Many steps are required in order to ensure that the tank will perform and accomplish the mission, including installation of the communications equipment, the basic steps in conducting preventative maintenance, checks, and services, as well as a host of other tasks required to ensure operation. In addition to the tank itself, many hours of training are required for the tank commanders, loaders, and gunners. The experienced Non-Commissioned Officers of H Co trained all these tasks to standard during Rotation 19-05. While deploying the new tank to the field, Troopers quickly gathered that the M1A1 Abrams is not an OSV or OSV-T. They had to adapt quickly to the rigors and near combat like conditions that The National Training Center has in this new weapons platform. As the combat arm of decision, the tankers of H Co not only welcomed the challenge, but also displayed the M1 Abrams power while honing their war fighting capabilities. 1LT Mark Holcomb was the Platoon Leader responsible for the receipt, integration and operational use of the Abrams tanks during the rotation. He had only positive things to say about how the vehicle operated, the ease at which the vehicle could traverse terrain, or how lethal the tanks were on the battlefield. “Compared to other vehicles, the M1A1 Abrams has few peers and it was a joy to lead my platoon from it” – 1LT Mark Holcomb. H Co Troopers learned the importance of the M1A1 Abrams use of fuel and the logistics of supporting it consumption. The M1A1 Abrams has a 1500 horsepower turbine engine, which uses roughly 2 gallons of fuel per mile, takes roughly 10 gallons of fuel to start, and has the capacity for 504 gallons of fuel. During decisive action operations, the Abrams must fuel two times a day or it will not be able to sustain the fight against the enemy. This is a new lesson for H Co troopers who are not used to this level of fuel need. It was a good lesson for Hawg Company as it put new stressors on how to sustain itself. During combat operations, the Abrams led the way. 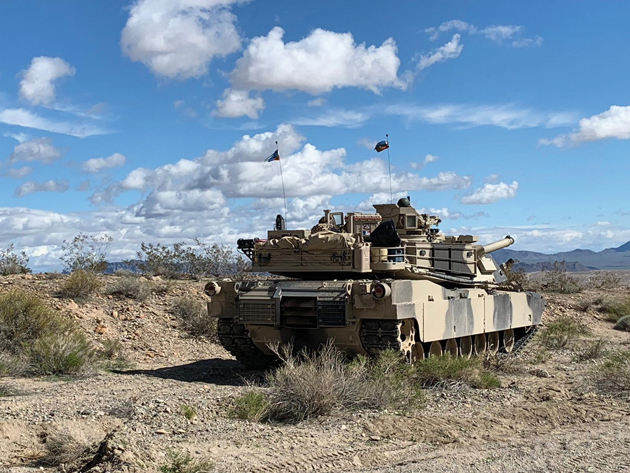 During the Training Day One Brigade Tactical Group (BTG) attack, 1LT Holcomb, commanding his Abrams, was able to better lead his unit, maneuver on the enemy, and fulfil his higher-level mission. In the words of one Observer/Controller on the ground, “I would be scared to be in the Rotational Unit and see these tanks coming at me like that.” Because of their use, H Co, in conjunction with its Mechanized Infantry Battalion (MIBN) partner Fury Infantry Troop, was able to win the day using Combined Arms attacks. This allowed the BTG to successfully breach in the Valley of Death and continue the attack proving the Abrams is a combat multiplier to the 11th ACR. H Co learned lessons in the operation of the vehicles and in their use on the battlefield. These lessons will make Hawg Company more lethal in the future, set conditions for a successful gunnery, and make H Co Troopers better tankers that the rest of the US Army employs throughout its Armored Brigade Combat Teams. Hawg will continue to employ the M1A1 Abrams tanks until their gunnery – and many more lessons will ultimately make a lethal force stronger. Hawg Tank Crews prepare their tanks for transport into the Box. Tank Crew maneuvering into position during a battle at NTC..